Insurance can be confusing for those outside of the industry, and there’s long been discussions on how to make it clearer for consumers without dumbing down too much, or missing details about the insurance contract, and the trust in the insurance relationship. We have commented in a previous blog article about the costs that are built into the typical UK motor insurance policy. Some consumers might be surprised to know how much gets spent on personal injury and whiplash claims for example (24% of the total), or Insurance Premium Tax (currently 12% at the standard rate). In fact only 18% of the average motor premium is spent on administration costs, the quoting, underwriting and pricing process, and commissions paid to brokers and price comparison sites. When we recently surveyed* 1,500 motor insurance consumers, the results show that almost six in ten motorists (59%) believe insurance providers ‘consistently’ charge too much. Another 36% believe insurers ‘occasionally’ charge too much, and only 5% say insurance costs are fair or close to what they would expect to pay. Some of the consequences include customers ‘gaming’ quotes across price comparison sites, manipulating their personal information along the quoting journey (in approximately 35% of cases), as well as choosing not to notify insurers about minor non-claims incidents, and a degree of cynicism and mistrust. To the extent that there is a lack of trust or a disconnect between the cost of insurance and what motorists are willing to pay, there should be an understanding that the amount a customer pays is calculated, based simply on the claims of other people similar to the customer, driving the same type of vehicle or living in the same area, how many claims they tend to make, and how much these cost. Insurers on their part need disclosure of the information needed to defeat the organised fraud rings, ghost brokers and ‘cash-for-crash’ gangs which are adding costs onto the industry, and ultimately onto honest policyholders. Our research also showed there is a willingness in principle to show loyalty to an insurance provider. There’s a view that loyalty should be rewarded by the insurance provider, especially amongst older consumers. More than six out of ten motorists say discounts should be offered to policyholders who are likely to buy multiple products from an insurance provider. The same number of people also believe discounts should be offered to consumers purchasing direct from the insurer, rather through an intermediary. 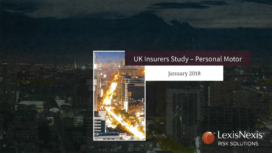 In general insurance in the UK we have arrived at a point where the price comparison websites (PCWs) are performing a useful function and they’re widely understood and used in the shopping process for motor insurance (33% of policyholders buy from them, and another 29% shop for price on them but buy elsewhere). Yet in some ways they have turned the industry on its head, removing the direct relationship between the insurer and the insured, and they’ve contributed to making insurance a commodity purchase, driven mostly by price. The pricing and underwriting journey has become so competitive and dislocated between different PCWs, software houses, between a broker or a direct insurer, that it is challenging for an insurer to compare like-for-like, when identifying a particular customer against a new customer. Our LexisNexis® services such as Policy Insights and Quote Intelligence are designed to bring more clarity around the quoting journey, and bring data to the point of quote where it can have the most impact (and bring the biggest cost savings), but there is still more to be done. Other parts of our motor insurance survey showed that the percentage of policies sold by phone has been rising, from 20% of all purchases in 2015 to 24% in 2017. This compares to purchases on price comparison sites, which have fallen slightly, from 38% in 2013, to 34% in 2015 to 33% in 2017. It seems this trend is likely a result of more policyholders shopping on price comparison sites, and then phoning their existing insurer direct for a price match. Thus we can see there are different consumer behaviours at work, connecting online to offline. The message we take from this is not to neglect call centre resources, as part of the 360-degree customer relationship. Whilst 56% of motor insurance customers overall buy online (and 33% through a PCW), still 24% complete the transaction by phone. In our survey, 59% of motorists said they renewed their policy in the current year with the same insurer. Greater information and data on the individual and their preferences are what’s going to be necessary to drive a more inclusive and immersive type of insurance, where the insurance provider can predict the individual’s intentions and needs, and deliver with a higher degree of trust. There are some interesting examples emerging of a new approach, where motor insurance is bundled with car subscription packages or pay-as-you-go models, similar to the way health insurance can be sold in the context of gym membership or fitness devices. Looking to the future, the big opportunity for insurers is probably going to lie in harnessing new insights from telematics data—out of connected vehicles and other hardware sources—to more accurately price the risks of individual drivers. How rapidly these types of data-driven models can be deployed of course depends on the ability to capture, process and harness data. In the insurance industry there’s certainly a willingness to change. Being trusted is key to the provider of any service, none more so than insurance, which ultimately has a moment of truth in payment of the claim, typically in the event that something unpleasant or distressing has happened. From our perspective as a data aggregation company, at LexisNexis Risk Solutions we know that greater granularity and availability of data, more often than not, results in lower premiums for the consumer, and also lower risk (more precise risk selection) for the insurer. So it’s a virtuous circle, and a journey of improving customer satisfaction, driving out hidden risk, that we will continue to support. For more insights from these research results download the LexisNexis Risk Solutions motor insurance white paper ‘Curing Consumer Scepticism with Technology and Education‘. *LexisNexis Risk Solutions carried out an anonymous survey, the Policy Renewal and Insurance Shopping Study, 23 January to 5 February 2018. Data collection: web survey using managed online panel as a sample. The sample was 1,500 consumers who have insurance on the vehicle they drive most often, who are equally or solely responsible for insurance decisions, and who purchased motor insurance within the past 18 months. Follow the link to the LexisNexis Risk Solutions website to find out more about how we support insurers.